Enrol before 30 April and save $100. This unit is designed for current or aspiring healthcare professionals that require a broad range of medical terminology. In Healthcare, being able to interpret and apply medical terminology appropriately is essential for medical administrators to understand their role, to perform certain tasks and communicate effectively. Preparing reports for insurance providers. 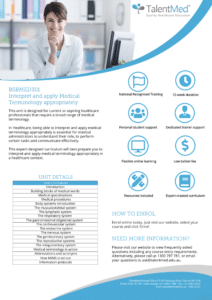 TalentMed’s nationally accredited BSBMED301 unit includes comprehensive training in Medical Terminology. This expert-designed curriculum will best prepare you to interpret and apply medical terminology appropriately in a healthcare context. TalentMed offers high quality and affordable training, with one simple, low-cost tuition fee. You can enrol in this course online at anytime, 365 days a year. Alternatively, please call 1300 737 781. Once enrolled, your course login details will be issued within 1-2 business days. TalentMed’s BSBMED301 course is delivered entirely online, so you can progress through your studies at a time and place that best suits you. We recommend that you study at least 5 hours/week to complete the course within the 12-week intended timeframe. However, if you devote more time to your studies, you can finish the program sooner. Qualified Trainers and Assessors with decades of experience in the Healthcare industry. These trainers have professional experience in both vocational education and healthcare documentation, making them uniquely qualified to answer questions about both the curriculum and the industry. What options are there available to upgrade my skills? Please check out some of our Diploma level courses below. Is the course unit nationally recognised? Yes, TalentMed’s BSBMED301 Interpret and apply medical terminology appropriately course unit is nationally recognised. Upon successful completion of this unit, you will receive a nationally recognised Statement of Attainment. This transcript can be used to apply for Credit Transfer (CT) or Recognition of Prior Learning (RPL) with TalentMed courses or other nationally recognised training. Being the number one RTO in healthcare education, TalentMed is the first place that you should look to upgrade your skills. A TalentMed education gives employers confidence that you have the practical skills and industry knowledge to perform your role. 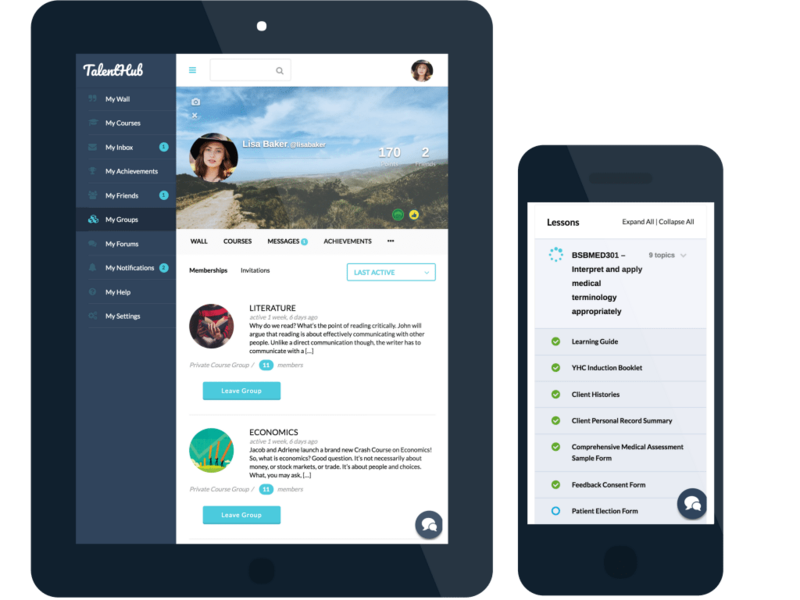 In addition, TalentMed’s expert-created curriculum is specifically designed around the Australian Healthcare industry rather than adopted from generic information. Is the training industry approved? 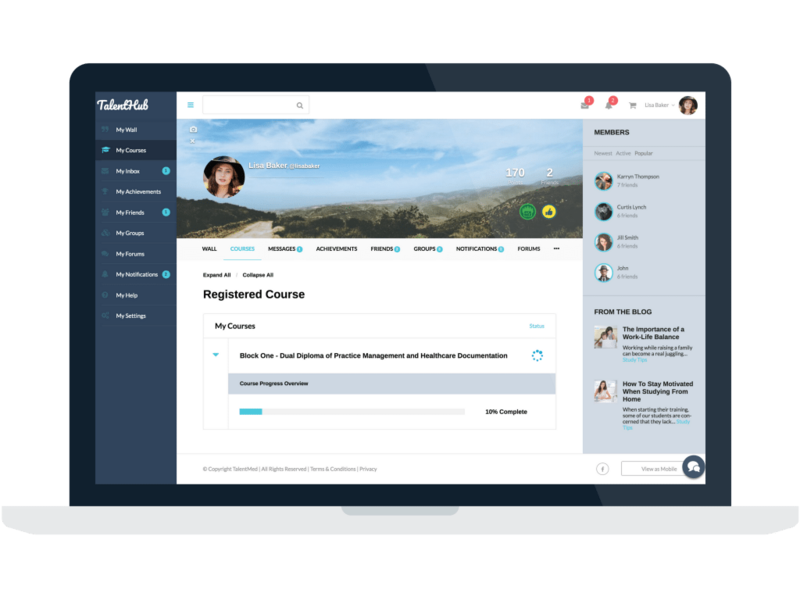 TalentMed continuously seeks industry feedback to ensure its training and assessment materials are relevant to workplace needs. As such, TalentMed undertakes extensive industry engagement to ensure its courses are aligned to employer and industry stakeholder expectations. Do you offer a group discount for multiple enrolments? Yes. We offer group discounts if you’re enrolling more than one person in this course at the same time. This is perfect for businesses looking to upskill their staff or friends who want to study at the same time. Please contact us on 1300 737 781 or email ask@talentmed.edu.au to find out more. evidence of successful completion of an Australian Qualification Framework (AQF) Certificate II or higher qualification (where the language of instruction is English). If you do not have an Australian Year 10 Certificate or have not successfully completed an AQF Certificate II or higher qualification, we will send you login details to complete a quick Language, Literacy and Numeracy (LLN) pre-assessment to confirm your suitability for the course. Students must demonstrate Exit Level 2 (or higher) competency in both reading and numeracy. Request a free course information pack.